Stanley Hicks, Service Engineer has spent almost his entire career, 39 years, working with JF Andrews, part of the Enisca Group of companies. Stanley said working for JF Andrews for nearly four decades had been a "good journey". "I worked for 3 different owners over the period and been through various changes along the way, located at different depots, met with a lot of different people and made some good friends along the way. I will miss the people - after all this time you will always miss the people - and I will miss the customers, we have great customers up here." 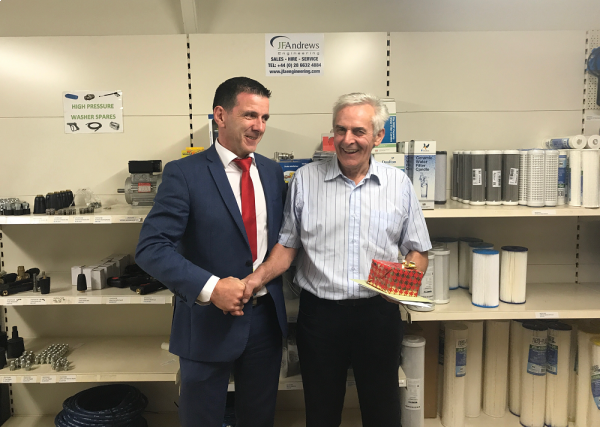 Staff at the company bid Stanley farewell with a presentation of a gold watch at the Enniskillen depot where he was based, and a voucher to spend on a well deserved holiday. Rory Hampsey, Group Operations Director said, "We are not even going to attempt to fill his shoes, 40 years of experience is irreplaceable. We congratulate Stanley and his family on a tremendous career, and wish him all the best in retirement."